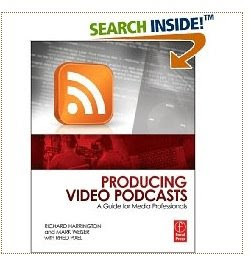 I invite you all, from beginners to professionals to buy Rich Harrington's excellent book, "Producing Video Podcasts: A Guide for Media Professionals." It is full of very helpful information, even for the working professional. Rich and the crew at Rhed Pixel have made a living out of helping others, and this book is no exception. Written with his business partner Mark Weiser, this book is a virtual compendium of ways not to make mistakes. A great easy read, and a reference book to keep around always.